I so wish I could invite all you girls into our little home and we could sit around and enjoy steamy cups of coffee (with whipped cream -- my new pregnancy craving ;) and cookies as we chat! But since we are all scattered over this planet, I thought it would be fun (and had a few requests over time) to share our home with you in blog post form! We moved into our apartment right after our honeymoon, and there really couldn't be a sweeter home. We are blessed to live right on the sandy beach in Los Angeles in the tiniest little studio apartment. It's one room plus a semi large closet and bathroom! But it's truly been perfect for the two of us these first 7 months of married life -- we haven't minded the small space one bit and have loved every moment in these bright and cozy walls. Seriously, some of the happiest memories of our lives have happened here and we've only just begun. Marriage is a blessing and a gift, and I am ever so thankful for out little home by the sea. I've savored every moment here so far. Being a wife and making a home with my husband has been, like, my biggest lifelong dream. I so enjoy all the home arts things, like even folding laundry. And being a Home Ec major in college, there were so many things I am able to practice that I learned now that we have our little home! (Not that you cannot do those things single -- I just didn't have my own space for a really long time!) My man is literally the sweetest person in the world and he is such a servant's heart, helping me make our apartment homey. I am honored to try to make it sweet and comfortable for him! I found this pillow at Home Goods while we were engaged and just love it! perfect for newlyweds! Excuse my crooked frames ;) #Keepingitreal -- I found these little gold gems in Daniel's hometown of Guthrie, Oklahoma at a little swapmeet for $1 total! Score! 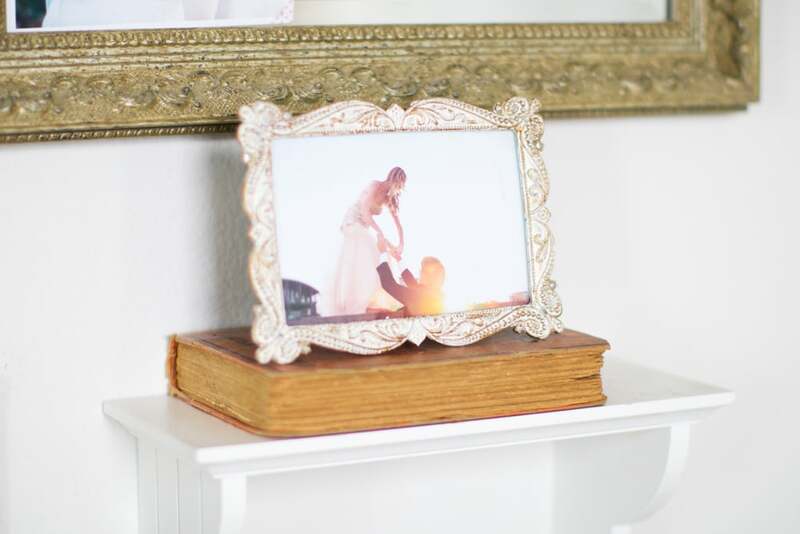 my favorite little shelf, engagement photo, and vintage copy of a louisa may alcott book, by the bed. my pale pink desk (built in the 1920's and found at an antique store near my parent's mountain home for $30!) I love this little space and do alot of work here as well as use the left side and drawer as a vanity for putting on my makeup -- can't beat the lighting from the wide window and the dreamy ocean view. i love this nook you see right when you walk in., atop the white storage shelves. My absolute favorite body wash peeking out behind our shower curtain! It's organic and totally natural and can be used for 18 things! including cleaning -- i actually mop the floors with it because it's safe for pregnancy, gets them totally clean, and smells so pepperminty -- made with pure essential oils! One of my jewelry organizers that hangs on the bathroom wall. I got it at francesca's this past summer! I just adore seeing all my necklaces organized instead of tangled up! These necklaces are from J.Crew and Forever 21 but are older so not listed -- linked some similar below! THe green one on the right is from my friend CArrie Grace's shop! And the white one is from Wal Mart (of all places!) but guess what? wal mart is like the world' best kept secret on stylish costume jewelry. Seriously, $2 earrings. You'll thank me later. some favorite earrings :) once again, some are wal mart! The rest, forever 21. H & M.
my wedding perfume + a few other favorite treasures. Part two (kitchen area and living area) coming next!